Hands on and interactive displays complement exhibits of fossils, skeletons, and life-size reconstructions. The Museum has earned a reputation nationally for its excellent interpretative techniques. Dinosaurs ruled the land for about 150 million years, finally becoming extinct 65 million years ago. Our fascination with dinosaurs started in the 1820's and when in 1841 Sir Richard Owen invented the word "dinosauria" - meaning terrible lizard - to describe this group of prehistoric monsters, a kind of dinosaur fever or 'dinomania' was created. The visitor immediately encounters a skeleton of the famous meat-eating dinosaur, Megalosaurus, with its sickle-like claws and teeth, mounted over footprints made by that dinosaur. It vividly contrasts with the skeleton of the small fleet-footed plant-eating dinosaur, Hypsilophodon displayed in the same gallery. The life-size reconstructions beg to be touched by small hands. This is encouraged, along with the handling of some fossils. The juvenile T rex is 3.6 metres tall and over 6 metres long. Tyrannosaurus rex is one of the largest meat-eating animals ever to have lived. Adjacent to T rex is Deinonychus with its sickle-claw, whilst nearby is Stegosaurus, distinctive for the double row of bony plates arranged along its back and the large spikes on its tail. The Museum's courtyard is dominated by the reconstruction of the massive Triceratops, characterised by its enormous head, bony frill, and three long horns. Computer and cinematic programmes relate the fascinating story of these prehistoric animals. 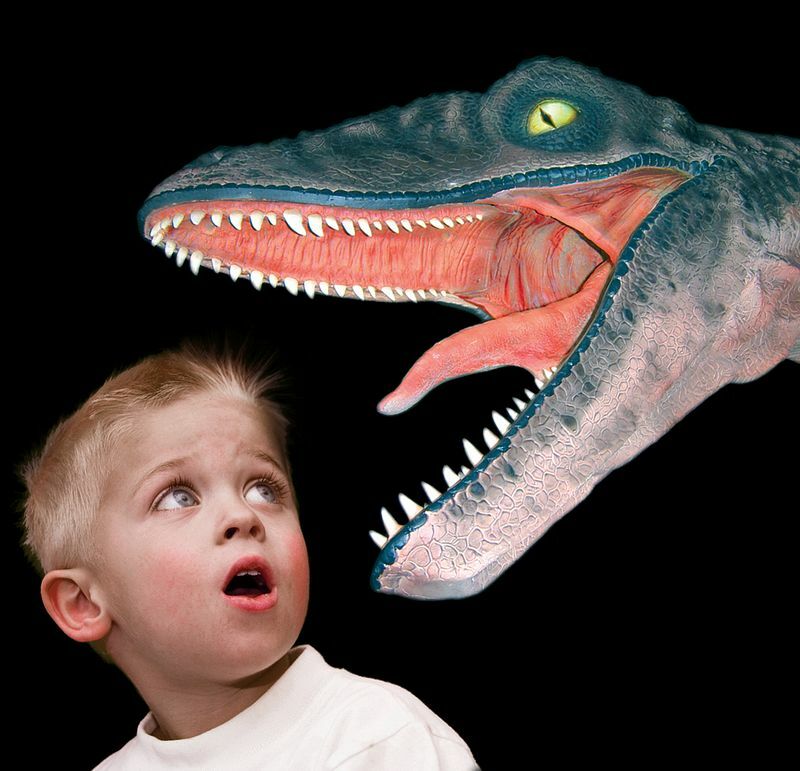 Visitors can feel into the past with the 'feely' box and discover what a dinosaur really felt like, if they dare! The colour chamber gives the opportunity to experiment with different colour combinations and to speculate on what colour dinosaurs were -nobody actually knows for certain because colour does not fossilize. Feel a Fossil allows you to identify various fossils by touch alone. These are just a few of the hands on and interactive displays. Three-dimensional displays and exhibits are complemented by a wealth of informative graphical and pictorial material. Displays are stratified vertically with simple facts low down and more in-depth information higher up. The Dinosaur Museum is regularly featured on television, appearing in documentaries, children's and entertainment programmes such as Blue Peter, the Tweenies and Tikkabilla. The Dinosaur Museum was nominated for the European Museum of the Year award in 1985, the year after it opened. Since then it has been awarded Dorset's Family Attraction of the Year in 1997, and acclaimed as 'one of Britain's ten best child friendly museums' in 2006.Most recently the museum has featured as one of the AA's Top 50 Days Out. The Dinosaur Museum is in the centre of Dorchester. Use the town centre car parks and the museum is only a very short walk from any of them. Look out for pedestrian signs.